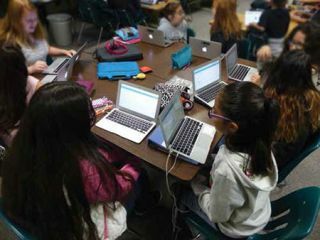 Whether they’re using an adaptive product to offer some blended opportunities or are redesigning the entire day to deliver a comprehensive blended experience, many schools are seeing positive results from combining online and offline instruction. Here are some of their stories. Mesa View students enjoy their center-based instruction. Because every student has a laptop, a large portion of the instruction has been embedded into the Tier 1 curriculum, including programs like ThinkCERCA, a personalized literacy platform that teaches critical-thinking skills through argumentative writing across the curriculum. “Our language arts teachers started using ThinkCERCA last year and our proficiency in reading and writing doubled in all areas,” says Gardenhire. Teachers use PlayPosit to create videos that they can embed with animations, questions, and activities, and students watch the videos at home or during the day, when teachers divide classes so that one group watches instructional videos while the other receives direct instruction. For math, teachers use Agile Mind, a rigorous program that infuses social and emotional learning into core curriculum. For classroom management, teachers use LanSchool to make sure students are accessing what they need on their devices. In addition, Mesa View uses Edsby, the learning and analytics platform. Students use Edsby to download worksheets and activities, access lessons they’ve missed, and check their grades. Teachers drop their lessons plans into Edsby and post which tools they’re using in the calendar section so that other teachers who want support with those tools can reach out. In 2010, Falcon Virtual Academy opened in Colorado Springs, Colorado, as a virtual school. In 2014, it became the Spring Studio for Academic Excellence, a K–12 school that expanded the virtual concept into something else. “We wanted to bring students into the building because being completely virtual was isolating,” says Rochelle Kolhouse, instructional coach for School District 49’s iConnect Zone, which includes Spring Studio and two other schools. “Based on feedback, we decided to create something that would be exciting, hands-on, and motivating.” That’s how they developed iLearning, an interdisciplinary project-based curriculum comprising themes like the Renaissance Era, which incorporates science, math, social studies, and English as students do writing assignments and design buildings and costumes. To go from virtual to blended, teachers figured out what made more sense to do face-to-face (F2F). Kolhouse, Colorado’s Online Teacher of the Year in 2013, had science students come in to do labs in groups. The school continued to evolve, and today they use Schoology to create, manage, and share the curriculum. Spring Studio students attend F2F classes on different days: grades 6–8 come on Mondays and Wednesdays, K–5 on Wednesdays and Fridays, and high school students on Tuesdays and Thursdays. “When students come into the building they do project-based, hands-on, deeper learning—the things they can’t do online at home on their own,” says Kolhouse. “What they do online is expanded upon, enriched, or taken to a deeper level when they are in the building.” Pikes Peak Early College and Patriot High School are the two other blended schools in the iConnect Zone. Pikes Peak partners with Pikes Peak Community College to offer college courses to its high school students, who are in the building Mondays, Wednesdays, and Fridays for F2F lessons and do their online work at home or elsewhere on Tuesdays and Thursdays. Patriot is an alternative high school with a robust CTE program. Students are at the school to complete their online and F2F lessons five days a week because they require more structure. All three schools use Edgenuity for their online core curriculum and eDynamic Learning for electives. Spring Studio also uses ALEKS, an adaptive math program, and Reading Horizons for reading and literacy instruction. Teachers know where each student is at, thanks to a variety of digital platforms. At Lancaster ISD, teachers implement blended learning in the way that works best for their students. Kimberly Lane Clark, blended learning specialist for Lancaster (TX) Independent School District and an ISTE 2017 PLN Computing Teachers Network Excellence Award winner, shares a few tips from her teachers’ forays into blended learning. Blended takes different forms, depending on the class. A high-school world history teacher in the district does F2F teaching on Mondays or Tuesdays. On the other days, students do the online modules he creates in Canvas and come to him only if they have questions or need something retaught. Blended takes time to implement. Clark and one of her teammates, a secondary science school-support officer, are working on a blended pilot with a group of eighth-grade science teachers. They plan out lessons every six weeks. The graduation rate has tripled at Bishop Hall Charter, largely because of the blended environment. The school uses D2L’s Brightspace as an LMS. Teachers like building their own curricula and use Khan Academy or create their own videos. Class discussions and lectures are recorded and added to the LMS, along with PowerPoints and class notes. Because of this, students have round-the-clock access to their work. Huckans estimates that close to 90 percent of the curriculum is online. The first thing Genevra A. Walters, superintendent for Kankakee (IL) School District 111, did when she came to the district was to redesign general education for grades K–6 into college and career academy classes. Now, each grade level focuses on a career strand, such as human services in education, health sciences, or communications and information systems. Walters partnered with Defined Learning and developed a project-based learning platform using Defined STEM, a Web-based application that helps students connect classroom content and careers through project-based tasks and reading and writing activities. Now that teachers have grown comfortable with Defined STEM, they’re working on creating personalized learning environments. “The only way to be effective with class sizes of 20 and 30 is by using technology, and I encourage teachers to have it as a station or center,” says Walters. That way, some students can work in small groups while others are on their Chromebooks. Students at Hermiston School District love the flexibility and freedom of their Flex Program. A couple of years ago, Hermiston (OR) School District began experimenting with flipping and blending classes as part of the district’s Flex Program. Several high-school English, US government, and US history classes now use a combination of FuelEd online courses and teacher-curated materials to deliver a new kind of learning experience. Students can work at their own pace and are not always required to attend class because they’re allowed to work independently. “Students love the freedom and the fact that this college-like atmosphere requires them to be more responsible for their learning,” says Mindy Barron, guidance and career coordinator. As a result, teachers plan their classes differently, put more thought into what happens during class time, and have transformed themselves to better meet students’ needs. Nearly 200 high-school juniors and seniors have taken one or more FuelEd online electives such as Latin, computer science, and fashion design. During the elective class period, students complete online assignments in the computer lab. They can also do some of their work at home, which allows them to work on other projects during the day. Here are some of the collaborative spaces at Cleveland Elementary. At Clevelend Elementary School, part of Rowan-Salisbury (NC) Schools, we’re disrupting traditional classroom practices by introducing our students to many different and engaging ways to learn, and blended learning is our approach to create a seamless learning experience for our students. Our teachers are facilitators of the learning experience and become coaches who encourage and expose children to learning paths with many different options. Our first-grade students experience everything from Bee-Bots to virtual reality to help bring their learning to life. Students use Bee-Bots to blend programming and curriculum standards. They work collaboratively in groups and use critical thinking and problem-solving strategies to make decisions, debug, and answer grade-level challenges that incorporate math, literacy, social studies, and science skills. Elementary students use programs such as Nearpod, CoSpaces, and ThingLink to demonstrate mastery of content. These tools help immerse the students in virtual worlds and give them experiences that they would not otherwise be able to experience. With these tools, students can walk inside a Native American home, walk on the surface of Mars, tour the White House, or walk the decks of the Titanic. We must give our students choices in their learning, but they must also be guided and encouraged to stretch their thinking beyond what they already know. This is the only way to ensure that our learners are prepared for an unknown future filled with devices and careers that have yet to be invented. Our goal with blended learning is to try to be as student-centered as possible and to provide many different opportunities for choice. One way teachers do that is by finding children with common abilities to work on a specific goal. They break students into groups and have them rotate through stations. Each day, every student cycles through different learning activities. Every lesson on a playlist has been developed to help students acquire a specific skill or achieve a curricular goal. The students cycle through the stations, work collaboratively, work with the teacher, read independently in Achieve3000, or complete one of the activities that have been designed to help them build mastery. All of the stations align with the prescriptive and personalized goals. Students know their assignments, which are posted in the classroom and on each student’s playlist. I believe it’s becoming necessary for students to learn to code—it’s as fundamental as learning the ABCs. Most jobs will require a basic knowledge of computer coding. Have you been to McDonald’s lately? Employees must be able to perform many different functions that already require these skills. Just imagine what it will be like when our fifth graders are in high school, preparing for their first jobs. —Lynn Bradley is technology facilitator for Cleveland Elementary School.